Triathlon – I’ve vaguely heard of it – no idea what it entails. Running: I have never been a runner, I was the kid that was always last at school. Cycling: Yes, I’ve ridden bikes, never a road bike & no way would I ever wear lycra! Swim: I can swim, not squad swim just swim. Looking for a challenge, a sport, something to join. I head to the sports expo. Triathlon, looks good, only need a bike, runners & swim suit. There’s a local Woman’s Only Tri coming up. 200m Pool Swim, 8k ride, 2k run. I can do this! Excited but nervous I sign up. 1st dilemma, what do I wear (I’m pretty body conscious) I decide on shorts over swimmers and a Tee. The unknown and I knew no-one, I’m just going to have to wing it. Nervously I wait for the start. The swim went well, ride was hard 8k going as fast as I could, the smile never left my face! Finally the run leg, wow, my legs – I wasn’t expecting that. This is hard, I run/walk. Finished, very proud I have completed my first triathlon and I loved it! That was fun, it was hard but I love a challenge. I quickly update my bike & start riding more (my current bike was 2nd hand costing $200, it has served its’ purpose). Pretty pleased with my training I’m riding up to 11k a day, a regular on the Bluewater Trail. I complete another Triathlon, this time stepping up to an Enticer Distance, 250M swim, 10K ride & 2.5k run. This was scary as the swim was in the ocean & I recall it was far from calm! Pleased with myself I complete my 2nd Triathlon. Ride was harder, and once again I walked/ran. I recall someone running past & me saying how do you run! I was inspired & impressed by seeing people actually running the whole race. Once again I loved it, where to from here, I wanted to do more. Meanwhile I start a new job. Walking downstairs one day I see a face, a familiar face that I saw at triathlons. I was to learn this was the face of Nikki Giles, Triathlon Coach who had a training group called Tri-actiV8. My life was about to change! I meet with Nikki to discuss joining Tri-ActiV8. We talk, we look at goals. My goal was to do a Sprint Distance Triathlon and ultimately an Olympic Distance Tri. In the same meeting I mention I’m turning “50” next year and being a milestone I would like to do something special. Busso replies Nikki, Busso I reply, what is Busso? Half Ironman (70.3) she replies. I laugh, there is no way, I’ve done 2 enticers & she’s talking a 70.3, my 50th is less than 1 year away! My training with Tri-ActiV8 starts. Surprisingly my run is going very well, who knew I could actually run! My riding increased, I got cleats, I was getting confident. By now I was pretty much obsessed with triathlon. I loved it, I loved the training, I loved the V8 training group, I was thriving. Unfortunately as I trained my “aliens” were growing. I had several tumours (non-benign) in my stomach. I knew they were there & my theory was “I’ll exercise them out” Mentally I blocked them out until physically I could no longer do anything that required bending. An operation had previously been discussed but me being me thought they’re benign, I can live with this (denial). I revisit the doctor as I’m now in pain training. We do another scan and he wants to operate pretty much immediately. Doctor was Friday, Scan Monday he wants to operate Thursday, No! I had a duathlon Saturday. Let’s wait for after the weekend – we opt for Tuesday. Duathlon completed with a fantastic result. Coach Nikki 1st, Tri-ActiV8'er Mel Harris 2nd & myself 3rd. I went out on a high. Operation went well, they were amazed how I functioned let alone trained with my aliens. My surgeon described 2 of them as being the size of a babies head. Time to heal & rest, I head home to NZ for recovery. I return to Mackay in time to volunteer at the Mackay Tri Festival. I yell and scream at all the awesome triathletes on course, it’s hard, I want to be out there, this was supposed to be my goal race. Slowly I start training again. I was keen to catch up. That seed had grown, that 70.3 seed. Yes, I had missed the Olympic Distance Tri lets go straight to 70.3. (I had completed 2 sprint distance triathlons by now) I register for Cairns 70.3 in June 2016 (not Busso, Cairns was closer to travel to and only a month after my 50th). Cairns is in my sights. Once again I upgrade my bike. I’m getting too enthusiastic, Coach Nikki is continually reigning me in, she worries, she worries I will break. Too much too quick. Christmas comes, I head home to NZ. I take my bike, I have my training plan. “Please be careful” she says (she knows I’m pushing myself). I get some good rides in. I ride Rolleston to Akaroa 81k of hills (hardest hills to this day I’ve ever ridden & solo)! It was hard, it was good. Run, more hills. Port Hills (Christchurch’s famous training ground of cyclists & runners). I’ve been instructed “don’t run downhills” I head up Port Hills, to the trails. It’s stunning, it’s beautiful, the view is awesome! I’m on a high, I run back, downhill at speed, flying, this feels so good! The day after I wake up, I’m sore . Day 2, I’m really sore, bad sore – why? My training had been going so well I tell myself. The doctor advises it’s my hip, my core is weak, running downhill has caused damage (too much too soon). Result: no running. It needs rest and needs to heal & we need to strengthen your core, you’ve only recently had major stomach surgery. My stomach plummets, I see my dream, my goal fading. Nikki is not phased, she is the most positive & supportive coach. It’s ok, we have time you just have to be patient. Let the process work. She increases my swim & bike – no run. The doctor advises another 9 weeks – no run. I try to coerse Nikki to let me run, not once but many, many times I battle to be told no each time! She is adamant, no run. We will get you there. It’s now April, I’m still not running. Swim and ride is going to plan, I have fitness. In the meantime a spot keeps appearing on my leg, it comes then goes. Get it looked at I’m advised. No, it’s ok, it goes away. Finally! I’m running, run is going well, monitored closely (actually watched like a bloody hawk!) Finally everything is coming together, everything is going well! One week to Cairns. It’s getting exciting. We’re now tapering, the training is done. I do the Mackay Marina Run 8K and come 1st in my age group. This gives me some renewed confidence in my run. The day after (Monday) the spot returns this time red & angry and this time it’s not going away. I’m in agony, by lunchtime my calf is twice the size. I can barely walk. I hobble to the doctor to be told I have a nasty infection. (Latertests were to reveal it was a secondary infection) We drain my leg, given anti-biotics and sent home to rest. Wednesday evening Nikki has one look at my leg and takes me straight to hospital. The Dr advises, “As a doctor I need to advise you not to race” BUT I have completed Ironman events myself so totally understand the training you have endured to get this far. Here’s the plan, so with advice & stronger antibiotics off we go. We head to Cairns. The hype the atmosphere this is amazing. I’m actually here, I’m about to do a Half Ironman, one year ago a seed was planted and here I am today. What a journey!!! Race Day, the swelling has gone down in my leg, it’s tender but time to shut it out of my mind. What will be will be! 5 hours 59minutes later, I cross the finish line, placing 8th in my age group. Running down the Ironman Shute is like no other feeling. Jubilation, pain, relief, pride, I did it! I later asked Nikki did you every doubt I would start? No, never she replied never. I know one thing, without the coaching and amazing Tri-ActiV8 Tribe support this would never have happened. The training it was hard but we had so much fun, laughing was definitely on our programme. The support was incredible. So many memories – great memories at that! Too many names to mention and thank, we all know who we are – not to forget my extremely supportive and patient husband Tony. I’m now stronger and my passion for triathlon is huge. The buzz of competing, the buzz of watching others believe & achieve their dreams. So inspiring! I can now also pass on my passion and triathlon experiences to others having successfully achieved Triathlon Coaching Accreditation. After Cairns from July to December I don’t stop, placing in every event I enter. A jam packed 6 months. In August I finally do an Olympic Distance in Yeppoon (placing 2nd in may age group), Yes, my earlier goals are now complete! I continued into 2017 racing, travelling to Brisbane for Nissan State Series placing 3rd & coming 4th overall in the series (age group). Busselton 70.3 placing 3rd, Zach Mach (my 1st adventure race) placing 2nd, then finally Cairns 70.3 taking 33 minutes off my previous years time and coming in 6th place in my age group. 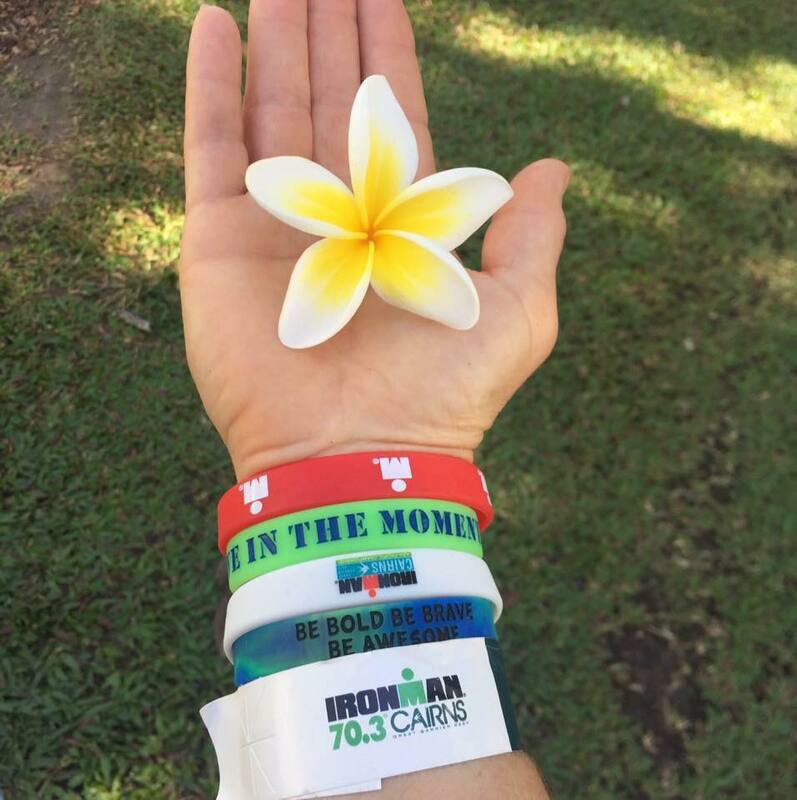 Live in the Moment: We were all given a wrist band from Coach Nikki prior to 2016 Cairns 70.3 which read “Live in the Moment”. I was to look at my wrist for inspiration many times when the going got tough. To this day I still wear it, I still look at it, and it still gives me inspiration. Now to pull back and build for my biggest challenge yet…………..
Tri-ActiV8 are lucky enough to support Mackay Cycles with their encouragement of Women in Cycling. On Saturday, 17 June our Tribe supported Mackay Cycles with three groups of ladies riding 20km, 25km and 35km through Mackay finishing at the ever popular 'My Kitchen' on Wood Street. It was great to see new riders and new mum's start out on the 20km/hr group with a roll out to the Harbour Break Water. The 25km/hr riders had a combination of newbies and experienced with a very streamlined ride out to Erakala and back via the River Road. It was great to see a few of the traditional 25km/hr group stepping up to the 27km/hr group with another streamlined group travelling out through Walkerston! Mackay Cycles has been hosting the ever popular WO Ride since October 2015 to connect Women in Cycling. The rides provide women with new skills, confidence in group riding and new friendships. The ride leaves Mackay Cycles on the second Saturday of every month with further details being available on their Face Book page.